Former scientist Galen Erso lives on a farm with his wife and young daughter, Jyn. His peaceful existence comes crashing down when the evil Orson Krennic takes him away from his beloved family. Many years later, Galen becomes the Empire’s lead engineer for the most powerful weapon in the galaxy, the Death Star. 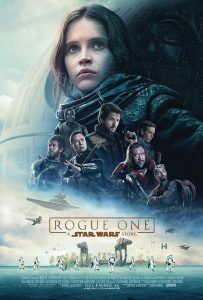 Knowing that her father holds the key to its destruction, Jyn joins forces with a spy and other resistance fighters to steal the space station’s plans for the Rebel Alliance. Come and join us for a fantastic opening event to the festival where we hope it will get your taste buds going for the rest of the festival! Food and drink available to purchase on the night.